My name is Richard Koza. I trade on the world’s stock and currency markets to make money and to increase my family’s wealth. 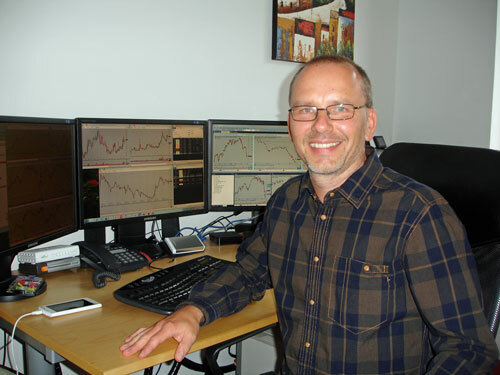 I also share my knowledge how to make money on financial markets by trading and investing with my readers and clients. I also provide investment advisory service for individuals and institutions. I have traded stocks since 2001. I managed a Global Macro hedge fund as a portfolio manager since 2009 till 2011. I live in Prague, a beautiful city in the Czech Republic in central Europe. It’s known by its very old history and historical sites. Also, it has the best beer on this planet. A lot of people know the Czech Republic because of famous ice hockey players like Jaromir Jagr and Dominik Hasek. Choosing a career in stock market trading wasn’t my idea. It was my wife’s! Nice, isn’t it? More than ten years ago, she said to me, “Hey, you know where you can make a lot of money? On the stock market! So go and learn how to do it.” She started to learn trading with me, but when our junior was born, she devoted her energy to his education. I was asked to lecture at a local investors’ conference about my trading methods. Later, some people wanted me to teach them my trading methods so I did. I use my daily trading routine and experiences to teach them everything I know as their personal trading coach. I don’t have any hidden secrets. Later I created this site. My strategies, my ideas, my tips – it’s all out there for you to see. If you’re already doing stock trading online, I hope that my experiences – both my wins and my failures – can help you reach your goals. If you’re not doing stock trading online but thinking about it, you can see what it’s like, see what’s involved and make decisions on your own without having to pay someone and be subjected to the possibility of false claims and wasted money. Please feel free to subscribe to my stock trading newsletter and get exclusive my thoughts, tips, and ideas regarding stock trading. Thank you for taking the time to read this, and I hope to see you on the website sometime soon! I wish you a lot of good and profitable stock picks.